Over two decades ago Picnic at Ascot introduced the British tradition of stylish, high quality picnic baskets to the US. Picnic at Ascot is recognized as a leading designer of fashionable picnic products that combine style with function and offer exceptional value. Products designed by Picnic at Ascot are assembled in the US and have a lifetime warranty. Fully equipped insulated backpack for two people with detachable wine holder. Fully equipped cooler for two in many different colors with an easy access drink panel. Insulated tote with a divided cooler with separate sections for food and wine bottles. Stylish tote with a front pocket that contains a large fleece blanket and coffee flask. Insulated wine and cheese cooler large enough to hold to bottles. Large leak proof insulated tote with a zippered compartment containing a picnic set for four. Fully equipped insulated backpack for four people with with a large fleece blanket. Upscale, Thermal Shield™ insulated picnic cooler with service for four. A variety of trunk organizers for the car including collapsible, and coolers. Durable multi pocket tote with three stainless steel garden tools. Stylish stadium seat features comfortable padding on seat and back. Fully equipped insulated backpack for two people with with a large fleece blanket. Fully equipped cooler for two with an easy access drink panel and large fleece blanket. This set has a double walled insulated flask with service for two. 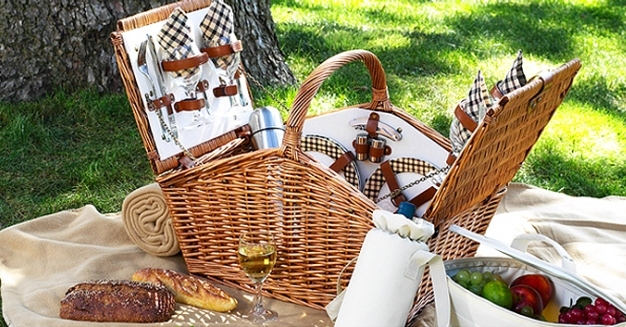 Collapsible picnic basket with place settings for two is both elegant and practical. Collapsible picnic basket with place settings for four is both elegant and practical. Fully equipped cooler for four in many different colors with an easy access drink panel. Picnic cooler contains service for four with removable wheeled cart. This tote easily folds flat for storage and pops open for use with no assembly required. Large selection of barbeque tool sets, grills and aprons. Selection of chairs and picnic tables that can be easily folded and stored when not in use. Fully equipped insulated backpack for two people with thermos and mugs. Insulated wine and cheese cooler tote with a large fleece blanket. Unique round shape with two toned fabric containing plates and utensils. Large leak proof insulated tote with a zippered compartment containing a picnic set for two. Fully equipped insulated backpack for four people with detachable wine holder. Fully equipped insulated cooler for four with a hand grip and shoulder strap. Fully equipped wicker picnic baskets with service for two or four people. Unique collapsible Thermal shield™ insulated beverage cooler with leak proof lining. Insulated picnic basket to keep food and drinks at the perfect temperature for hours. Selection of bamboo cheese boards, cutting boards and bread boards.